A unique series for sophisticated writers, readers, and eaters, Eat, Drink & Be Literary brings major contemporary authors to BAMcafé for intimate dinners, entertaining readings, and engaging discussions. Each evening begins with a sumptuous buffet prepared by BAMcafé’s acclaimed executive chef, Tim Sullivan, served with select wines and accompanied by live music. Following dinner, authors read from and are interviewed about their work, take questions from the audience, and sign books to conclude an evening of candid glimpses into the creative process and the rich writings it yields. The event begins at 6:30pm; doors open at 6pm. 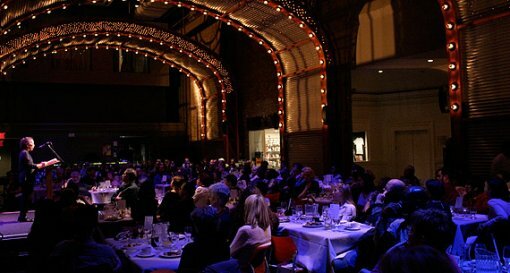 Friends of BAM may purchase tickets to Eat, Drink & Be Literary events starting Nov 9. This season’s author’s include: Wallace Shawn, E.L. Doctorow, Lynn Nottage, and Sam Shepard. Check out the full author schedule after the jump.